This recipe is a long time family favorite. I can't imagine a holiday without Green Bean Casserole. Completely from scratch, no canned cream-of-anything needed here! Our family is OBSESSED with this recipe. It makes an appearance at every holiday get together-- Christmas, Thanksgiving, Easter, Sunday dinners, everything. 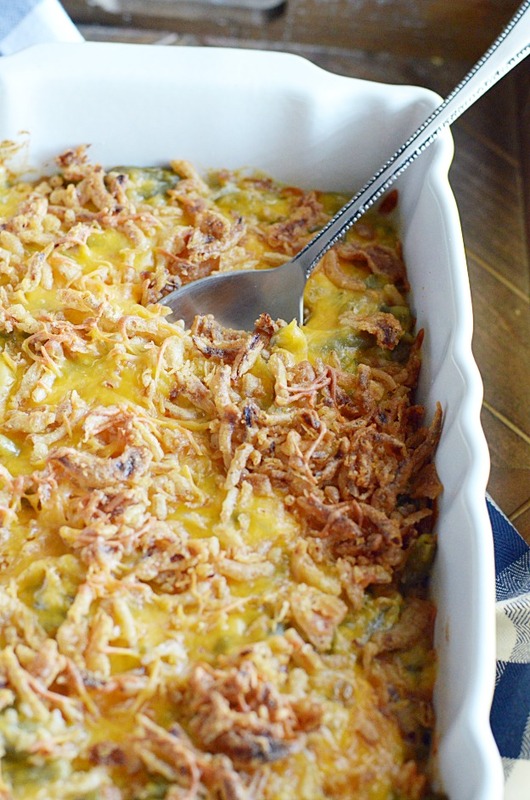 We seriously love green bean casserole. I didn't realize until I was an adult that this recipe is really unique among your typical green bean casseroles. Mainly because it contains absolutely no cream-of-anything condensed soup! There are no mushrooms, no mystery sauce, nothing weird. You'll need butter and flour for a traditional roux. Add to that sour cream, a few seasonings (including a little sugar, which I think is the key secret ingredient), the fried onions and cheese, and then green beans of course! You'll never make green bean casserole any other way once you've tried our Grandma's recipe. I guarantee it! Over medium heat in a large pot, melt the butter. Stir in the flour, salt, pepper, and sugar. Working quicking so the flour-butter mixture doesn't burn, mix in the chopped onions and then whisk in the sour cream. Remove from heat. Fold in the green beans, half of the fried onions, and half of the cheese. Spread the mixture in a greased casserole dish (9x13). Spread the remaining cheese and onions on top. Note: this can be made ahead of time and chilled until ready to bake. But be sure to let it sit at room temp for an hour or so before baking OR allow for additional bake time if you put it in the oven straight from the fridge. This. is. the. best!! My second batch I used fresh steamed green beans. Was even better with fresh!! So glad to hear you loved it! I am going to have to try it with fresh green beans one of these days-- brilliant! frozen (1 16 oz bag of french cut to one cup of sour cream,) and I omit the sugar because I don't think it adds anything. I often use dried minced onions, as that gives a nice toasty flavor. If I don't have Corn Flakes on hand, I'll use crushed Ritz crackers or breadcrumbs. I've even used Frosted Flakes! This is a Thanksgiving staple and usually comes out at Easter and sometimes just a regular old Tuesday.